Two more deserving high school students received scholarships, and the University received the Corazon Award on Friday at the 26th annual Valle del Sol Profiles of Success Hispanic Leadership Awards celebration at the Phoenix Convention Center. The Corazon Award honors leadership, outreach and service within Hispanic communities throughout Arizona and the Valley. 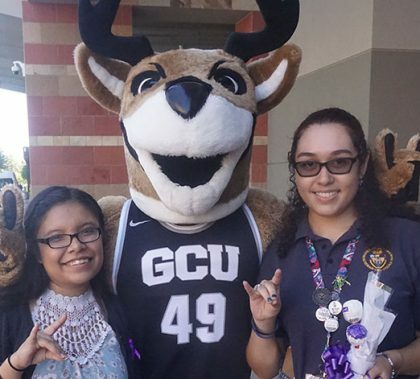 By all accounts, the 2016 Welcome Week was a huge success, said Charity Norman, GCU’s new student and family programs manager. The long list of new activities and socials proved popular and not too overwhelming, so much so that Norman said her team is looking at possibly adding even more events next year. It takes copious research and a flair for fabric to create costumes that transport audiences to other places and times, but such was the feat of GCU Costume Designer Nola Yergen and Assistant Costume Designer Sarah Levinson, responsible for the clothing in the period piece “The Mousetrap,” playing one more weekend at Ethington Theatre. Along with various student workers, the designers are now putting together about 150 costumes for “Of Thee I Sing,” opening Oct. 14. This week’s edition of Antelope Intros features two University counselors. One is a military retiree who can’t put a price on family time. The other is a learning enthusiast who enjoys singing a song or two. The future of printing can be seen through 3-D glasses, and Titan CEO Joe Manzo was on campus Wednesday to explain it to members of the IDEA Club. The presentation was part of the Canyon Angels entrepreneurial program. There were so many options for students to explore at the annual Colangelo College of Business Kickoff on Wednesday in GCU Arena, it took many of them an hour to sift through them all. Particularly noteworthy were all the new entrepreneurial opportunities and the change in how Canyon Challenge entries will be submitted. Since the Grand Canyon Beverage Company (GCBC) opened its doors in August, it has transformed the second floor of the Student Union into the coffee-and-conversation hub its GCU graduates-turned-managers envisioned. 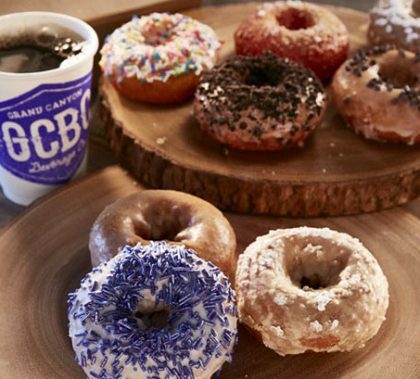 GCBC, which also serves funky donuts, breakfast sandwiches, coffee from a tap and an array of other beverages, is one of three student-run businesses GCU is launching this semester. GCU’s passion for its local community extends to the food on campus this year. 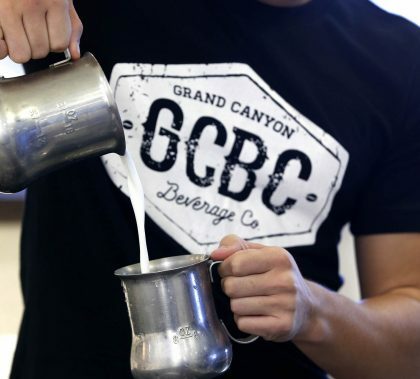 A record number of local businesses supply items in the Grand Canyon Beverage Company (GCBC) and other campus restaurants and stores. “We want GCU to flourish, but we want the community to flourish with us,” said Brennan Williams, the GCBC general manager.